Can you afford to buy your new trailer from anyone else? 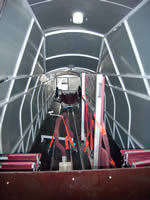 Shirenewton Sailplanes offers a trailer that is the most comprehensive product on the market. Not only in quality and price, but the trailers include a long list of items that are optional extras on competitors products. 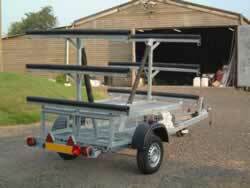 We also now stock or manufacture many other trailer accessories. Why not let us maintain your sailplane from a humble K6 to the latest JS1, including motor gliders. We are experts in all aspects of wood and glass repair. From C of A inspections to competition preparation Shirenewton is the name to trust. We also design and build specialist commercial trailers. Just call, tell us what you want and we will do our best to satisfy. Let us supply all your accessories, dollies, rigging aids, tapes and adhesives to keep your glider in first class condition. UK Agent for the revolutionary Jonkers JS1 Revelation competition sailplane.